Leopard seal (Hydrurga leptonyx) visits South Australian shores all the way from the Antarctic pack-ice region. 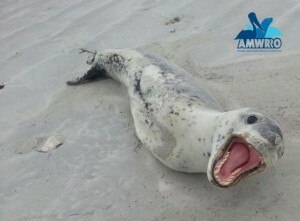 Young Leopard seal resting on the beach – named snappy! AMWRRO is currently coordinating the care and protection of a young Leopard seal (Hydrurga leptonyx) in the states southern region (named Snappy). This young animal has several small scars and two open wounds on its face and neck region. AMWRRO crew have attended and will be monitoring the animal closely over the next few days and flippers crossed the animal will return to the Antarctic waters on its own accord once rested; a very rare animal to have in our waters considering the pack-ice environment in which they normally live in the Antarctic region. Please remember there is a 30m no approach zone for any seal on the beach and Leopard seals have a large mouth with very large teeth and they aren’t afraid to use them. AMWRRO is currently working with the Department for Environment Water and Natural Resources (DEWNR) and will monitor the animal closely over the next few days. If treatment is required the animal may require onsite treatment or risk being euthanased if brought into care. Attack of the killer pelicans – or have they been trained to do this? AMWRRO is currently caring for one of several pelicans that have caused some concern at the River Torrens in Adelaide’s CBD by snatching people’s lunch out of their hands. Despite what some may say, this is no fault of the pelicans as these birds are opportunistic feeders and those people that continue to feed them have unfortunately caused this problem (albeit with good intentions). Everyone must understand that these are wild animals and must be left to fend for themselves as oppose to relying on people for free “hand outs” and therefore, allowing the birds to think that everyone will just hand them food. 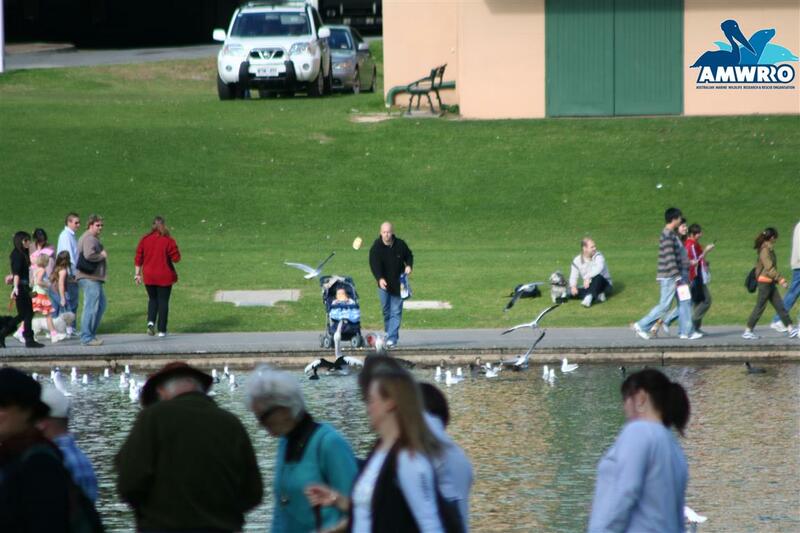 People feeding Pelicans bread at the River Torrens Adelaide CBD. Unfortunately the food in which the birds are fed (bread and other human foods) is of poor nutritional value and can cause long term complications for the animals. This includes ducks, swans and other water birds that have become “imprinted” by well-intended people who feed them and who teach children to do the same. The bottom line is; if it doesn’t belong to you, don’t feed it. You will only cause the animal harm in the long run and even death in some cases. One adult male pelican was captured earlier today and has been introduced to other in-care pelicans at AMWRRO Wetland Facility on Torrens Island where is will undergo rehabilitation before being released back into the wild at a new location. Amelia’s stomach showing two ganged hooks. South Australia’s recreational fishermen are more likely to snag pelicans than any other marine birds, who are often the victim of fishing line and hook entanglements, according to new research. 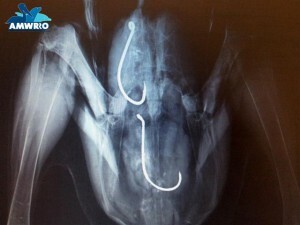 Fishermen are being warned to be more aware of the risks to seabirds and to report any injuries as soon as possible. A study of 113 seabirds treated over a six-year period for 132 fishing-related injuries has been conducted by researchers from the University of Adelaide’s School of Medical Sciences and the Australian Marine Wildlife Research and Rescue Organisation (AMWRRO). They’ve found that, contrary to public belief, “live” tackle being used by fishermen is resulting in the bird injuries, not tackle that’s been thrown away. The results of the study are now published in the International Journal of Veterinary Health Science & Research. “Discarded fishing lines have often been attributed as the cause of injury to wild birds living along coastal and river regions, but until now there’s been nothing to show how widespread the problem is or why it’s happening,” says the University’s Professor Roger Byard AO, from the School of Medical Sciences. Pelicans were involved in more than 59% of cases, with gulls, plovers and banded stilts among the other most commonly affected seabirds. Entanglement and/or embedded hooks were the cause of injury in 97% of pelican cases, with only 3% involving ingestion of hooks. AMWRRO President Aaron Machado says: “By raising awareness of this issue, we’re hoping to educate fishermen about the risks to wildlife, so they can become more aware of those risks, to mitigate them, and to report them as soon as cases arise. Injured seabirds should be reported as soon as possible to AMWRRO on: 08 8262 5452.